We older folks often wish we were kids again, and rightly so (says my snap, crackle, pop joints). But, if we really think back to when we were little, we might remember some big struggles. Like learning to ride our bikes without training wheels. Learning to tie our shoes. Learning to read and write. Speech impediments. Getting glasses. That first day of school–so scary and exciting at the same time! Braces…ugh. Bullies and big brothers, and a multitude of bruises. Let’s not forget peanut or bee allergies. Then there were tougher things. Losing grandparents. Divorce. Perhaps even poverty and abuse. Things we don’t understand fully as adults. 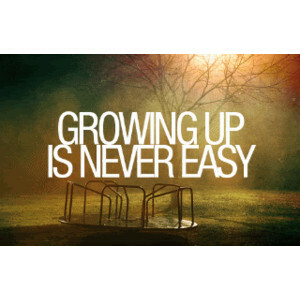 Some of us had togrow up a lot quicker than we should have. Next time you wish you were a kid again, remember the challenges little people face, and talk to the kids in your life. Ask them if they are struggling with something, and how you might help. Just like us, kids often need a listening ear and a shoulder to cry on. As one who survived those years, be there to guide them, because being a kid really is hard. < Previous Join Quentin’s Crew! Childhood is so different these days from when I was small in the forties and fifties. By comaparison my own childhood was idyllic, spent surrounded by the animals on the farm I lived on, climbing trees, fishing, scrumping fruit and generally enjoying life.